My mom & dad were Christians. I have one older brother. I married and raised four children. Even though I was Christian I didn't really know God. It wasn't until I was born again that I have a hunger in my heart to know, love and serve God. My life has never been the same. Praise the Lord! 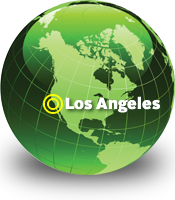 I have served as the receptionist for Asian Access since 1983. Pack light, but remember your Bible and journal. Wear good walking shoes and bring an umbrella. Don't forget gifts for those new friends you will meet and possibly stay with. Be ready for God to do a mighty work through you. That I pray and trust my Lord and Savior Jesus Christ to accomplish His will. Prayer, worship, and thanksgiving as we train and commission missionaries for the field. Seeing missionaries encouraged in their courageous obedience to God’s call in their lives. Praying for and with our missionaries. The importance of prayer and being a light to shine for our Lord Jesus Christ … Praise the Lord! 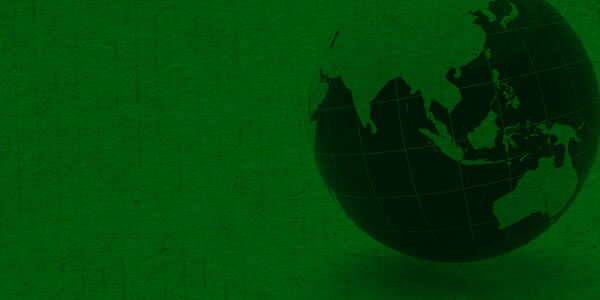 Why are you serving with Asian Access? 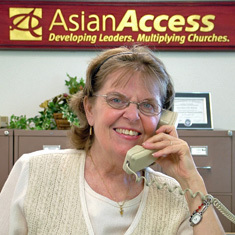 I am serving with Asian Access because I have the God-given opportunity to use my skills as Asian Access' receptionist to help people fulfill the plan He has for them -- whether it's to explore options to serve as a missionary... or to invest financially and prayerfully to expand God's kingdom on Asia!